University of Pennsylvania Ivy League School of Dentistry is a world leader in dental medicine, with a total average enrolment exceeding 700 students. The facilities, five on campus schools, have undergone significant and remarkable upgrades to support leading edge dental technology. BaseVac Dental Custom Vacuum Systems were selected on all five facilities vacuum upgrades. No oil, no water, 100% dry, quiet, and powerful dental suction. In certain situations, the vacuum systems were ordered through independent contractors and resold to the university, other systems were sent directly to the university. Five systems specified, delivered, installed, and working over a four-year period shows the commitment between the university and BaseVac to meet custom specifications and deliver easy to install products on time. 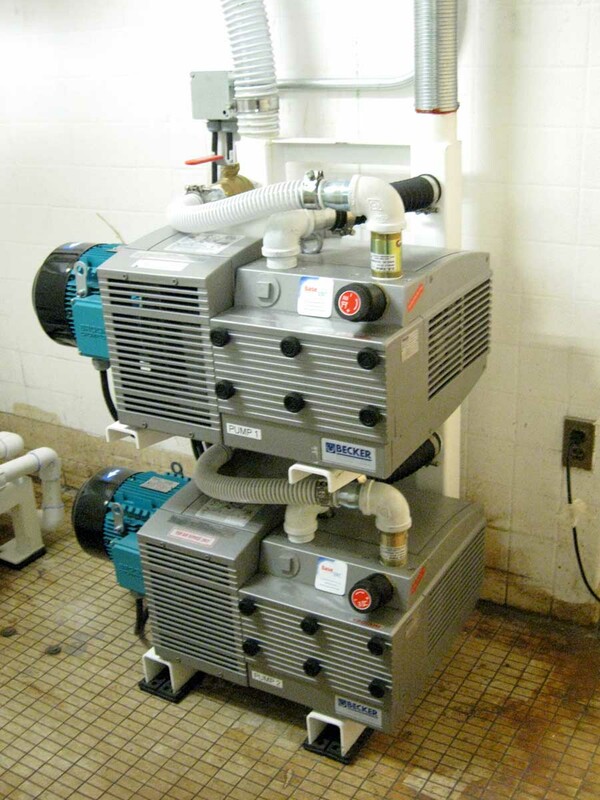 All of the BaseVac Custom Oil Free Water Free Dental Suction Systems and Compressed Air Systems are designed to conform to NFPA standards in compliance with CSA, UL standards. The BaseVac systems are compatible to connect to all major brand building management control systems. Model D 100 D Duplex Dry Suction System with two 5Hp vacuum pumps controlled by lead lag alternating PLC control. V80-20 Custom Dual Air Water Separator with built in continuous run auto drain to automatically capture and drain dental liquids and dissolved solids after the amalgam separation system. In 2013 The University of Pennsylvania Dental School required an overhaul and upgrade to their dental suction system. Located at 240 South 40th Street, the clinic is home to 25 dental full time dental suites. The clinic wanted to provide for expansion and increase the dental suction average power. The existing clinic provided 5 Hg” on average throughout the day. The BaseVac System installed is a Model D100D, two pumps, with the requirement for one pump to handle the base load. The goal was to raise the average level of vacuum in the system from the original 5 Hg” to 15 Hg” with fluctuations from 10 Hg” to 18 Hg” depending on demand. The result was excellent with strong suction throughout the clinic, no dead spots. Model 3HD4.40-3 Triplex Custom System with three 2Hp dry pumps controlled by a common hand/off/auto remote start control panel. Model V60-20 Custom Dual Tank Air Water Separator with built in continuous run auto drain to automatically capture and drain dental liquids from surgical applications. The second installation, shipped April 2014, was to replace old equipment at the Shil’s Clinic of Walnut Street. No mercury collection was required because it is an Orthodontics clinic. Model T100D Custom Triplex System with three 5Hp vacuum pumps controlled by a lead lag alternating PLC pump control. V80-20 Custom Dual Tank Air Water Separator with built in continuous run auto drain to automatically capture and drain dental liquids and dissolved solids after amalgam separation. Model C15-46 BaseVac/DV 15Hp Screw Compressors. Two complete systems, each with 15Hp compressor with remote, one 120-gallon vertical receiver, refrigerant air dryer, and air cleaning filtration system. Compressors supplied with alternating sequencing control. The third installation, shipped May 2015, was to replace and upgrade an existing vacuum and compressed air system at the prestigious Market Street Family Practice. The BaseVac system was purchased for future expansion to double current capacity. Model T250D Custom Triplex System with three 8Hp vacuum pumps controlled by a lead lag alternating PLC pump control. V80-20 Custom Dual Tank Air Water Separator with built in continuous run auto drain to automatically capture and drain liquids and dissolved solids after amalgam separation. 16 x HG5-HV Solmetex mercury collection units to comply with upcoming EPA mandated compliance. The fourth system installed, shipped August 2015, was to replace and upgrade the original suction at the Schattner Clinic with 54 dedicated teaching chairs. Model S500D Custom six vacuum pump system. Each dry suction pump being 25Hp, for a total of 150Hp. All six pumps controlled by a lead lag alternating PLC control centre. Two Model V120-20 Custom Dual Tank Continuous Run Air Water Separator with built in auto drain to constantly collect and drain dental liquids and line cleaner without vacuum interruption throughout the user network. The fifth system installed is one of the largest custom centralized dry dental suction systems in North America. Delivered December 2015 for use in the Evan’s Avenue School to provide suction to up to 300 existing teaching chairs with the capacity of 30% future expansion.